Leopold's Crate: Eleanor and Milo: an online store that sells unique, eco-friendly dog toys! Eleanor and Milo: an online store that sells unique, eco-friendly dog toys! 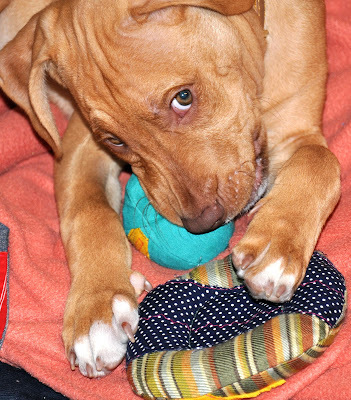 Leopold as a puppy playing with toys from Eleanor and Milo! When I first got Leopold, I bought a plethora of different types of toys because I wasn’t sure what he would be interested in playing with. Some of the first toys I got for him were purchased from a small online business called Eleanor and Milo. The business owner, Kate Butler, is a dog enthusiast with a creative soul and the skills to actualize her ideas and designs. The dog toys and accessories she sells are all high-quality, one of a kind, and are hand-made from reclaimed fabrics. I truly love the toys she makes (and so does Leopold!). The toys are durable, delightful, chewable pieces of art! And the cherry on top is that they’re also eco-friendly. Leopold has many toys from Eleanor and Milo and they are among his favorite toys. I love watching the joy he gets from throwing around his stuffed ball or his toss toys. L- How did you get started making dog toys? K- I have always been a maker. I have combined my passion for sustainability with my endless need to make things for as long as I can remember; early on that looked more like sculptures made of found metal, plants, handmade papers and woven vines. However, through getting a degree in Industrial Design, I developed a more holistic understanding of product research, manufacturing methodologies, and bringing a product to market. Eleanor and Milo began with my desire to dip my toe into that world… and I’ll be honest… my desire to have a GIANT box of toys for my dogs. L- Why do you make them? K- I make Eleanor and Milo dog toys because I love the idea of creating a product that will result in a tail wag… and maybe even a smile. When I hang out with my two dogs their joy and openheartedness is contagious. I find that one of the best ways to open my own heart is to interact with them - with intention and caring - and that giving them toys and treats is one way to do this. It’s just so good for everyone involved. On a personal level, I adore spending time in my studio, behind my humming industrial sewing machine, with my dogs on the floor behind me and my music blaring in the background while I piece together one of a kind toys and accessories. L- How do you make them--what sort of qualities are you going for? Every toy is made with at least two layers – sometimes more – of heavy-duty repurposed upholstery fabric, and then stuffed with re-purposed strips of fabric and a squeaker protected in its own denim pouch. Every single seam is sewn with upholstery grade threads and an industrial sewing machine. I like to use pretty simple construction methods for both the simple aesthetics and because in general the fewer seams the stronger the toy is. L- Where do you get the materials? K- Every material in Eleanor and Milo toys, besides the thread and squeakers, is up cycled or reclaimed. The upholstery grade thread I use is made in the US. The majority of my upholstery fabrics are –unused– remnants from the furniture manufacturing industry in High Point, NC. For exciting fabrics, denim for the squeakers, and jersey for the cowls I have two local thrift stores that I frequent. Both thrift stores amazingly donate their profits to animal organizations. And then on top of that I donate 5% of all proceeds from the toys to Independent Animal Rescue each year. Leopold tries to play with all the toys at once! L- And is there anything else you might want people to know about your awesome toys? K- My primary focus with Eleanor and Milo is to offer adorable toys and accessories that have a super small eco-footprint and encourage joy and lighthearted play. I think of each toy as a gift to both the people that order them and the pup that gets to play with them so, I gift wrap each toy in 100% recycled tissue and kraft paper then add a simple ribbon and note. I adore making Eleanor and Milo products, and hope that people continue to discover these toys and share them with others. Thanks!! If you’re interested in purchasing some of Kate’s amazing toys for your own dog, check out her Etsy store front! I'd also like to mention that Kate does custom work, so if you don't see what you want, make an inquiry: click "request custom item" under shop info.